Taira was mostly oblivious to the worry of the high class ponies in their carriages. His attention was still focused firmly on Blueblood, so he paid them no mind. "Lead the way, Blue-San!" The stocky easterner followed along cheerily behind, un-phased by the glares behind him from the passengers of the carriages. "So a Magic school, right? All of them are new mages for the most part, right?" Already he was curious, " It's been a long time since I've seen any advanced magic from other lands." In the back of his mind, he was only slightly worried that all the mages might be able to see him for what he truly was... but the prospect of seeing this place was just too exciting for him. He'd have to be wary of any particularly powerful magic user's though. Sudden magical swells like the ones Blueblood gave off might lead to more problems with his disguise and he'd rather not end up flooding the entire school with his mist if he could help it. The kirin eagerly cantered back up beside his fancy friend, "Are there any other very notable mages that teach there?" "Long, Long ago in Long Guo there was a beautiful queen and a Handsome Emperor. These rulers would protect and watch over the prosperity of the land for years to come. One day, The dynasty held a great feast for the greatest of their servants. Word of this great banquet reached all across the east and to the ears of devious fox from over the seas. This nasty beast concocted a scheme. On the way to dinner, the empress was spirited away and her likeness worn by the eight tailed beast. Throughout the banquet, the clever emperor noticed a strange dip in his wife's manners. His suspicions rose until he made a request for a particularly spicy dish to be served. The shock of the hot meal and powerful spices jolted the monster fox out of her guise. Thanks to the great spiritual advisor of the harmonious path, she was bound and captured and sealed away in a deep dark forest... Never to be seen again." --Excerpt from stories of the Early Feng Dynasty: The Foiled Fox. Let's Hope this strange creature is never set loose upon the Royal family again! 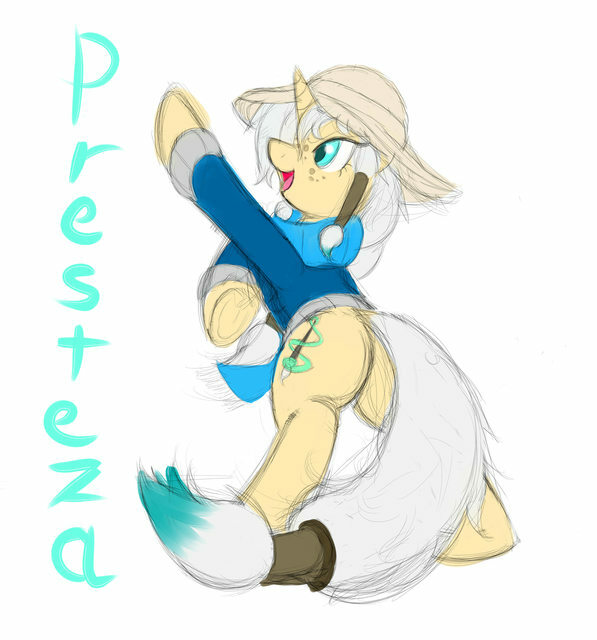 As part of the staff, I'm happy to welcome you to Canterlot! I hope you have a great time and create many fun threads with us! Hoshi could feel that shaking hoof all they way to her haunches. Were all equestrians so exuberantly enthusiastic? Keeping pace with the farm-mare's might hoof wasn't an easy task but eventually she weathered the energetic greeting. Normally she might have given Applejack her business card... but well, it was in Neighponese. "It's likewise a pleasure to make your aquaintance." A minty mane would dip as its owner bowed her head, "I look forward to participating in the festivities." 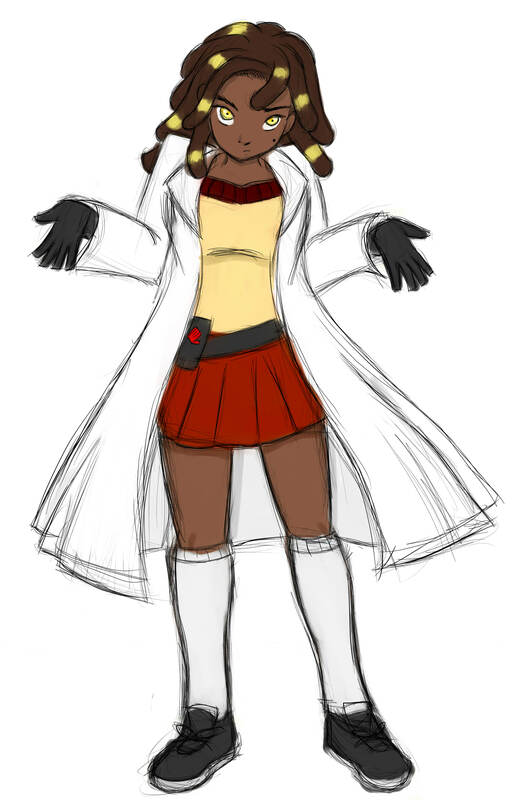 Questions about one of her favorite subjects soon came up: Kuzu. Hoshi cleared her throat and raised a hoof, the orbiting golem soon balancing on the center of her hoof. "This is Kuzu! She's my partner... well, not in the same way as you and yours though." Kuzu herself would bow deeply in greeting, "She's a smaller scale version of the Kuzunoha fox Golem in the Polohama Dome. Where the golem matches are held." A small roar made the mare's ear's perk up. When she looked down she noticed the young colt dressed in his adorable lion costume. Kuzu's initial reaction was to hop down in front of the colt then pretend to cower in fear of the mighty predator! Hoshi in her own more subdued attitude would smile at little Zap, "... A Fearsome lion, indeed! It's a pleasure to meet you, Zap. You and your mothers!" Eaten by a princess of the night? Now that was a curious thing to celebrate, but still oddly charming. If the costumes truly had to be 'worn' then Yama most certainly didn't fit the criteria at this moment. The suggestion of taking a trip to mister masquerade's booth was a good one, but she left to do that now...there was no telling on the candy that she'd miss out on! "Hmm..." The mare put her hoof to her chin and thought, "... I think I've got a better idea!" An audible ding could be heard from the kirin when she spoke up this time, as if one could hear the light bulb flickering on in her head. Once she'd gotten her treats from Mister Cain, Yama would take a deep breath and call out the excitable spirit of chaos mid bounce in a very accurate impression of the Royal Canterlot Voice. "DISCORD-SAMAAAAA! WOULD YOU DO ME THE HONOR OF CREATING ONE OF YOUR MOST ARTISTICALLY INCLINED COSTUMES IN THE VEIN OF OUR GREAT DRACONIC COMPANION?" The kirin's voice seemed to make the house nearby shake and rattle Candy Cain's stand! ... Then just when those caught within earshot thought it was over, "OH! AND COULD YOU PLEASE TELL ME MORE ABOUT THAT "MANIC MARSHMALLOW MARMALADE CAKE" THING? IT SOUNDS INCREDIBLE!" The mare's tail wagged rapidly back and forth before she looked over to the blue filly at her side, "How was that as a voice impression?" 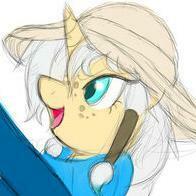 The approach of White rose made Yama tilt her head for a moment before smiling brightly at the spider pony. She certainly hadn't expected another like her tonight, but lately it seemed that this town had been chocked full of interesting visitor. The miniature princess' talk of costumes made Yama think, technically she was already in her own form of costume at the moment. Did this not count though since others wouldn't recognize it as such? "I suppose just saying that I'm actually a changeling in disguise would be a tad too easy a way out, right?" She tilted her head at the youngest addition to this growing entourage, "I'm not terribly sure what I could wear though, any idea what I might be able to pull off looking as I do, your highness?" Yama smiled brightly over to the fancy maid, "Candy time!" she would bark back with delight. Another yell came from not far away, coming from a handsome looking pinkish pony. He had a fancy candy stand! One could only assume that he was safe from any tricks thanks to that impressive supply of sweets. A small giggle came form the Neighponese kirin as she watch Discord conjure up a door in front of the stall and then knock. Seeing the work of a spirit of chaos up close was so awe-inspiring! Not long after the door had been conjured, yet another was attempting to get into the group. This one had a very curious aura to her. It seemed this Nightmare Night was just full of the doubly disguised. She bowed her head towards Kumo, "I'm sure we'd all be happy to have you come along, friend!" The mare's ears twitched at the sound of music. Were street performers really getting that good lately? Toboe lowered her paper just below her eye line to get a look at crowds swaying and moving around. Flute music wasn't something she recalled played terribly often on this street, it proved an interesting change of pace for not only her but evidently this enthralled audience. Even Toboe couldn't resist tapping her hoof along to the music. Rather than investigate further, Toboe lifted up the paper once again to try and figure out the route she'd end up taking. A question soon made her ears perk. Again, she lowered the map and looked up to the unusually tall looking unicorn before her. He was definitely a foreigner by the look of him. That strange horn of his and the abnormal height made it especially obvious. Was he some rare breed of pony Toboe had never encountered? His magic smelled normal enough at first sniff, "I'm well enough. I'm just looking to retrieve a supply of wine I was promised... " She looked up and down the stallion for a moment, "You're good with that flute. Play any other instruments? I'm hosting a party later tonight and I'll need entertainment." Her one visible eye shifted over to the filly nearby, "... Or would the president of your fanclub object to that?" "Go to Ponyville!" they said, "It'll be a hoot!" They said. So much for a scenic vacation at the heart of Equestria. It was a still a vacation, but with this crazy fog, there was nothing scenic about it. Back home in Polohama there were playable comics that had a creepy scene like this. Hoshi had played them now and then and this whole night reminded her of that story where some average looking stallion was wandering some fog covered town, looking for his deceased wife who somehow had written him a letter. Euch! Just the thought of that experience brought a shiver down the earth pony's spine, "Gimme a break..." The tourist muttered as her small golemic companion hovered around by her side, "Figures the first vacation I take in ages takes me into a horror show of somekind..." She could hardly see the muzzle in front of her face through all this fog Last structure she ran into was a cottage and that was weirdly empty. The one before that only made a steady growling sound when she knocked on the door. Now she'd been walking for almost half an hour before mist started to think out and se saw... a barn? A bit rustic looking, but it had a light in it. Any sign of life on this spooky night was a welcome sight. "Looks like we caught a break for once. Huh, Kuzu?" A cheerful chirp came from the hovering little construct at her side, the small fox golem floated in orbit steadily around it's master as she made her way to the barn. As soon as the two made it to the open door, both peaked around the corner and knocked on the wood, partly for luck and partly to make their presence known. "Oi! I hope you two-- er three aren't ghosts or something. I'd hate to find out I just wandered into the next world." Once the mare got a good look around she would smile and saunter in, whistling at the warm set up around her. "Well, I think this place is too cozy for the hereafter." "I'm Hoshi, A visitor from Neighpon." She dipped her head politely, "A pleasure to meet you all." Were dresses the in thing for this Nightmare night? With the arrival of Valen Orange, Yama couldn't help but feel even more under-dressed than before. If she could step around a corner or something, maybe she could conjure up some cute shrine mare outfit like mom would wear. With all this thick fog around though she couldn't help but think all she had to do was tak a couple steps back and she could get something... although might be a bit suspicious. The kirin would pull her head back down from the clouds and bow her head as Spike introduced her to the admittedly cute maid. "It's a pleasure to meet you, Valen-chan!" Again the mist around her would shift as her tail whipped about, "I told him that he really pulls of the look well too, but he seems a bit down on it. I'd offer to take it off his paw--er, hoo-- er, claws! That's right. Claws... but it looks like it's a pretty clingy garment!" Then came the wondrous arrival of the spirit of chaos himself! As soon as he popped in Discord would hear a round of applause all around him while the kirin clapped her hooves... and then it all stopped at once when she took a hold of her bag. The little design on the front of hers made her pucker her lips and make an "Ooooooo!" sound with her mouth before she did her best impression of the face on the bag with her pony face. "I love it! Can I keep this sack one the night's over, Discord-Sama!" With a delighted smile s he slung the sack over her side, "How'd you know I was even here?!" The answer to Yama's question would have to wait as the spirit launched into the explanation of the plan for the night. A ghoul? A monster of myth? Now that was something Yamakara had absolutely not experience or knowledge about. None. At. All. She had cracked open a monster manual for Oubliettes and Ogres now and then though, so the concept of a ghoul wasn't an alien one. If there was a special ghoul that gave out ultra rare candy around... well, Yama was NOT gonna miss out on that. No way, No how. Once Discord pulled out that little notepad, the little kirin's head slowly emerged from behind his shoulder. Curious eyes tried to get a look at this notepad over the noodle's shoulder, "Oh! I know a whole bunch of tricks we can try! What's the first thing we gotta d--" “HAPPY NIGHTMARE NIGHT!” Yama grit her teeth as she felt that incredibly loud shout meet her ears. She fell right down off the spirit's shoulder and plopped on her back. In a flash she was right back up with a delighted grin on her face, "That's incredible volume!" She pointed a cloven hoof Wind Walker's way, "You! You need to take up Opera! You'd be famous!" "Maybe he's costume shopping!" spoke up a particularly peppy voice from right behind spike, "This night kinda snuck up on me too, I couldn't even think of a good outfit in time! The strange blonde kirin would giggle and hop a few times around the well dressed Dragon, appraising him. It was such a cute outfit on him, Yama could hardly believe it. She couldn't help but notice that strange scent lingering on the fabric: It was a bit... chaotic. Soon the strange mare came to a stop and bowed her head, "I'm Yamakara! I'm visiting from the far off land of Neighpon! Are you going trick or treating tonight? do you mind if I join you?" Apparently this visitor was the exciteable sort, firing off a series of questions at the little dragon. Her tail also seemed to be eagerly wagging back and forth behind her, "Oh! I almost forgot to say! I love your outfit. It's so cute! How made it for you? Is it magic too?" This was taking far too long now. The supplier she called about her barrel of Rice-wine said it would be here today at nine o'clock in the morning. He'd said the same two days ago... Why was this taking so long? Home brewing sake wasn't a strictly legal affair and despite Toboe's history, she still had a respect for rules. At this rate she was going to have to take the Amazake off the menu for tonight. The very idea got a irritated scoff from the mare in the big empty bar. Karaoke night was coming and the last thing she wanted anypony to say about her was that she "Came up short" even once when it came to her bar. If there was one thing she confidently called the result of her own hard work, it was this place. After she finished arranging the glasses in a perfect triangle on the shelf behind her, She would sink down beneath the counter to pull out a large jug of the titular sake. She narrowed her eyes at the bottle, the drink within barely enough to fill single cup. "Okay... I've had enough waiting." She muttered to herself before setting the bottle back down, "If it's not coming to me, I'm going to it." The sign on the front door flipped to show off the closed sign. Once that was done it was pushed open, the bar's owner calmly strutting into the open sun. It was a beautiful day in the city of Polohama. One of -if not the- tech capital(s) of Neighpon and it was her's to explore today. The rest of the organization can handle itself for the day, she'd already given notes to her administrator and her lieutenants to spread the word of the party tonight and they had ways to get in contact with her if something went too far south. Toboe let the myriad smells of the city fill her nostrils like she was sampling the aroma of some finely cooked entree. Shops were looking pretty busy today, and those tourists who would flock to this city were out in force it seemed. Neon signs seemed to lay around every corner, the smell of gyoza, Taiyaki, Tokoyaki filled the streets. How she loved this city. Was there another golem fight in the dome today? She really should get back to following that sport, some of the kyodai and most of the shatei loved talking about those dramatic celebrities. Her stroll soon took her through a crowd of various ponies, Tourists and natives alike. The tide of equine almost turned her around until she managed to take hold of a nearby bench. Toboe fished around her saddlebag and pulled out a small map, "Hmm... the place should be a bit of a trek, but I should be able to make it. Maybe I should have brought someone along in case things go south somehow." Yama's travels had brought them far and wide across the land. She had searched far and wide for new songs, to find new sounds was her true test... and to sing them was her cause! Today, though her luck had been less than beneficial. 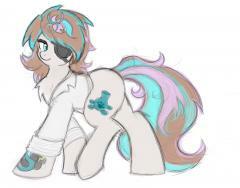 It had seemed a slow day in Ponyville since her dad wound up exposing himself at the running of the leaves she decided to make herself scarce and try out another look while she skulked around the town. Sometimes she found she'd get the most customers when she looked like this too! If she wasn't making any bits while looking like this, well that spoke badly for the rest of the day in her mind. Perhaps her adventure of the day lied elsewhere... The visitor from the east would lick her hoof and then lift it up to feel which was the wind was blowing. Looks like today it was a spooky forest today! Everfree forest wasn't necessarily the talk of the town, it was more like the hushed whispers of the town. Stories of cockatrices, manticores, owl-bears, timber-wolves, snakes and hydras came to her mind and only brought a big smile to her face. So many potential new friends of different shapes and sizes! She wouldn't be able to understand their speech, but she could at least provide some sweet tunes for them to enjoy: Music soothes the savage beast and all that.... and there weren't many beasts more savage than those from Everfree. ----in the depths of the forest---- "Wow..." She pursed her lips and huffed, "I am -so- lost. This place is huge!" she called out into the darkness. Even worse than being lost... there were no beasts that had shown up yet. What was up with that?! She heard there would be all sorts of cool creatures out here. The scent of a magical menagerie hung in the air aroudn her and yet she'd not run into any of them? Were they scared of her? Did they sense her true nature? Well, she couldn't get any creature to come too close so she'd just have to push ahead until she found her way out of this maze of brambles and leaves. The mare's pleasant humming would echo around her for a while until she noticed the sound of someone else in here. Awesome! From her position she could hear the faint words growing closer, there were two voices in here. Based on the conversation she'd heard so far, the two must have only just run into eachother. Did they something about an execution? That sounded pretty thrilling to escape from. Around the corner the mare hopped into view and waved over to them, "Afternoon!" She eagerly trotted over to them, eventually coming to a stop in front of them. "I'm Yamakara, my friends call me Yama-chan! What brought you both so far out here? You say you escaped an execution? That is so cool! Did you both meet here to make some sort of daring escape?" The questions came out rapid fire, with almost no pause for breath in between. The curious dragonhorse seemed to bounce in place with energy before coming to an abrupt halt and staring down pathfinder for a second. "Hey... You look really familiar. I swear I've seen your face on a book somewhere..." Her muzzle scrunched as she tried to place it, "Are you that pegasus who goes on adventures? If you are, well I hate ot admit but this place is sort of a letdown! I haven't seen a single manticore since I got here and I should know, I've been here like half an hour now!... or was it three hours. Time sure flies doesn't it?" Taira let out a warm chuckle towards the Guard pony, "You're concern is well appreciated, Sir Shield." Perhaps in an attempt to ease the stallion, Taira dipped his head towards him with a subdued smile. As the Old wolf allowed himself to get more comfy around this crowd he would try to distract the pony from any intimidation with another question, "Will I be seeing you at Boulder's party tonight?" Speaking of Boulder, Taira couldn't help but smile at the sight of his new friend's family. It made him feel a hint of regret he wasn't back in the mountains, at least until he remembered that he had family here already. When the okami let his eyes wander back over to the stands he couldn't help but heave a small sigh, seeing that Yamakara had seemingly fled. He could smell his pup hadn't gotten far. Had this old wolf already fallen into that stage when he'd wind up embarrassing his litter already? Time sure can fly can't it... That pang of sadness made his ears lower slightly, here he'd hoped to introduce that silly pup to everyone. Seemed that that may have to wait for another day for now. Hawke's approach brought a grin to the old wolf's muzzle. While she might have seen him as competition not too long ago, Taira was more than happy to congratulate the flirtatious griffin. "You ran wonderfully, Hawke-san." He bowed his head towards the griffin, "It was an honor to compete with you. As for cricks in the neck... I'll admit that was a bit of a common occurrence back in the day. I wasn't above laying down to talk to someone though." The big wolf would rub harshly at his nose, trying not to let the scent of cat so close lead him to ruining a potential moment between the griffin and Pinkie. Applejack's stunned question would earn another chuckle form the large yokai, "Well, Long lived most likely... and I'm not nearly as skilled a shapeshifter as you're thinking. That kirin shape is the first out of two shapes I can take." With a playful little smile he would wink at Applejack, "If you want to try and have a rematch when I look this I'd be happy to show you how fast I can be... hopefully the next time we won't have to deal with pepper slinging raccoons next time." He let out a soft snort as the very thought of that torture made his nose twitch. That description of his duties on the farm made him smile brightly, "I wouldn't have it any other way, Applejack... okay maybe I would prefer to sleep outdoors, but our pact means I have to stay in the barn. A yokai's word is binding. Very Binding." One that mysterious note he would turn towards Fire Walker and grinned"Walker-san! Congratulations on the finish!" The towering wolf would bow his head towards the red pegasus, "Perhaps we'll have a chance to speak more now that it's over." When little wind walked over, Taira went wide eyed and beamed. "Hello there!" He again dipped his head towards the Blue filly, "Are you Walker-san's little sister? It's a pleasure to meet you." The first to approach Taira in the tail end of his fit was Boulder. Honestly, he would be slightly saddened if that wasn't the case based on the stallion's goo will exhibited in the race. Windy sneezes changed to breezy coughs and then to a gentle snuffle when he felt he'd finally gotten most of that perfume out of his system. Now standing noticeably taller compared to the bulky country-colt he offered him a subdued smile, trying not to show off any teeth. "It's me alright..." Another soft cough came from the large yokai, "So... still up for that drinking contest? I think I might have a bit of an edge on you now that I look like this." A paw was offered in friendship to Boulder, large as it was it could still shake a hoof as the stallion soon learned. Ears perked at Heart Shield's question, "I could do with a tissue perhaps! Otherwise I'm perfectly fine." His response was punctuated by a soft sniffle. The arrival of the bouncing party pony made the big creatures tail start to wag about in delight, wisps of mist slipping and dissipating off the end of his tail as it waved about behind him. Once she got close enough he got down on his front paws and swiftly slipped beneath her as she came down on her last bounce: letting her land perfectly on his back. With his pink companion safely seated on his back he would eagerly walk back to the crowd with her and boulder, "To be honest I haven't gotten to attend a proper dance party in ... Hm... I think the last one was a millennia ago. Think you can teach this old dog some new dance tricks, Pinkie-san?" Taira was honestly surprised by how composed the mayor was, but he was most certainly not going to complain. Any official who could keep a stunned crowd calm after such an odd circumstance as this deserved his respect. Once he returned to the finishing line with two of the ponies he'd come to admire in this race he would nod appreciatively to the Mayor, mouthing a thank you her way once he was close enough. One pony he was sure was going to expect some answers. Applejack was having such a heartfelt moment with her kin and basking in her pride when Taira had to spoil it all by making a scene. "Well, I can't say for sure I know how much this clever one knows..." He glanced back to Pinkie for a moment then back to Applejack, "... But I think I can elaborate. Sorry for the scare back there and the bit of deception." He offered his paw to her , "The answer to that first question you asked is..." From the stands the descending yellow kirin rolled his eyes and rapidly stomped his hooves on the wood, producing a short drumroll that he ended the second the wolf spoke. "None at all! Like your mayor said, I'm an O-kami. I can be a kirin when I want to be... and perhaps earth pony or pegasus too, but my shape-shifting isn't quite as good as it should be. I stayed in that form as long as I could during the race as part of a bet with a certain mischievous spirit native to hear. Perhaps you've met?" He asked with a genuine sincerity, as he had not quite looked into all the details regarding recent events in this land just yet. The large would took a deep breath and then bowed his head towards Applejack, "And because I happened to lose the wager we made before the race's end... You have yourself a worker here for a month. I'll be sleeping in your barn as per our arrangement." "Hm?" He tilted his head at Pinkie as she remarked on his eye, "Really? It seems to be working fine... I can still see you after all." Like he said, his eyes were functioning perfectly well. The odd coloration was againthe result of the fatigue he was no longer feeling. He was so close to the finish line so he couldn't let the stress get to him. Even if some of his true form was starting to show he still was in the shape of a pony. That was the wager after all: Get to the finish line first in pony shape! If he could just manage that he'd be entirely home free. With the sound of music awaiting at the finish line, the sight of his family on the other end, and the good company out and around him... It was time. The stallion started to pull ahead of the herd with a manic grin. His great wake of mist touched leaves gaining on the rest of the team along with the rest of their collected leaves and debris. Even with a running this close in the moment, Tai did feel the distinct possibility he might fall behind... and this far in the race he wouldn't put it past his chaotic rival to pull some sort of absolutely madcap trick out of his hat. Although with all the energy and excitement flooding his mind, Taira would actually welcome it! He could really had to try and move quickly now! His guise was fading and now those words his friend's gave him just moments ago made a bit more sense! He had to move! Again, Taira found himself in awe of Pinkie's superior bouncing skills. Now he had to try and learn how to do that. For now though his thoughts remained on the race and the victory so close in paw. The more he saw of this party loving earthpony, the more he thought he should meet that blonde little ball of pep strumming away on the bleachers. If there was one thing he knew about Yama, it was that they loved merrymaking. "After you and Hawke-san meet up... I think I've got someone in mind for you to meet, Pinkie-san! Can't say I know whether they'll give ya those bedroom eyes,but I know they'd love to provide some music for the after-party!" While pinkie mulled the idea Over, Taira woudl slowly pull forward and let his mind again turn to the topic of Boulder. When Applejack posed the very question on his thoughts, Taira almost reflexively gave a shrug. He stopped himself just in time for the stallion ahead to answer them himself! Seemed he cooled down enough that he wasn't risking burning out early, but Taira did notice a sort of calm inner focus coming off the countrystallion. His mention of a special somepony and nostalgia certainly struck a cord in Taira's heart. While he hadn't seen any apparitions, an image in his hear was pushing him forward to at least come out ahead of the spirit of chaos! A sniffle came from the kirin, this time not from allergies... or well at least not so much this time. He managed to stiffen back up once the topic of alcohol was brought, "Oh-ho! I'd certainly like to try some of the Equestrian creature! ... But only if you try a bottle of Sake at the same time, Deal?" As Boulder managed to pull up nearby Taira and Applejack, the kirin would smirk back at his words. "I'll have you know..." He called back as his dash snapped branches and scatters a wake of dust behind him, "I'm an equal opportunity tease, Boulder-san!" Taira certainly hoped that he phrasing couldn't possibly be used differently in a separate context and made into something embarrassing. He jumped over one of his friend's namesakes and called back, "Watch your hooves, friend! You too, Applejack!" Boulder's words only emboldened the panting kirin's spirit, "You say that like this is the absolute end! Remember, you're gonna have a couple hungry ponies at your house... especially when I say..." The kirin took in a deep breath, filling his lungs with air and then letting it out in a booming voice that echoed across the track, hopefully reaching a certain pink pony's ear. "PARTY AT BOULDER'S PLACE AFTER THE RACE!" A devious grin was shot the stallion's way before Taira again tried to pull forward, only slowing when he realized that his friend said nothing! A glance backwards resulted in an arch of the kirin's brow. Boulder seemed to be staring at a vacant spot beside him and then tearing up, "You okay, Boulder-san? Look like you might have seen a ghost... well a ghost you must have liked!" Whatever got into Boulder's head clearing lit a fire in him as he worked to come ahead. That smile on Taira's face only got bigger as he watched his friend giving it all he had: It was simply inspiring! Taira galloped along , his pace still carrying him steadily ahead along with Applejack. He could practically hear the music in his head as the trees whizzed by him and his company. Having boulder worrying about him as he ran on ahead, starting to huff and pant took him back to his past for a moment. Back when the pack would race on he mountain tops Ranu would often pull aside in hunts to check up on him. The sentimentality was starting to make the old kirin a tad misty eyed... or maybe that was just a side effect from the burning sensation in his nose. Either way, he was proud to be run with Boulder at his side. "Nothing but a bit of foul play from a clearly nervous rival whose a bit scared he won't be the talk of the town for a few days!" A glance back would bring those vibrant green eyes of his to lock with Discord's red, "Seems some old mountains are exactly as young as they think!" He would yell back to the dark stallion. With Discord's minion and his dangerous pepper shaker disposed off, Taira could only hope he'd see that wily noodle in pony form climb whatever wall he was hitting. To add insult to Injury he would list off to the side, ensuring that at least strife would get caught in his competition's peppery wake. Even chaos was not above reproach... although you'd think some old spirits would learn that by now! Someone down at the stands had hopped up and was still playing to hype up the racers and possibly the spectators as well. If Applejack strained her eyes she would see a pastel colored kirin in the distance strumming vigorously at what would look to the untrained eye like some sort of long necked banjo! That must have been the kirin's 'pup' as he called him earlier, the little fella clearly had a song in his heart and was eagerly twirling and dancing on the seats where he could get away with it! A snicker escaped the bleary eyed stallion and with a shake of his head to clear his vision he found himself with further resolve. Taira also couldn't help but notice a small brown mare in the distance seeming staring daggers at him while she hoped and jumped around flailing pom-poms about. Seemed everyone had some family in the stands today! Even equestrian heroes had their limits it seemed, poor applejack wound up having to deal with the raccoon's peppery tactics not long after Taira had. Given how much of a toll this race had taken on his nose he still would have told the mare that she got the olfactory easy route through. He was still feeling polite enough to smirk sidelong at her, "Gesundhoof! That's what you say here, right?" A loud snap could be heard as the burly kirin snapped a branch beneath his weight and speed, "Let's hope both of us don't end up needing to share a tissue box at the end of this!" At this point he and Applejack were neck and neck, swapping spots at the lead as if each was taking turns lassoing the other behind the other. Taira may have started to feel the effects of his age,but as far as he was concerned... this was just him hitting his own wall and already he could start to feel the effects of his runner's high. "Hmm... Only waiting until now to name your terms, you're sneakier than I thought!" He snickered deviously as he moved to pull ahead, "You're a farmer right? Well how about if I lose I work on you farm for two weeks. No pay, no guestroom!" And for a moment Taira felt a sort of tension in the air... oh hayseeds: He may have just made a pact if she agreed or altered the terms and then agreed.